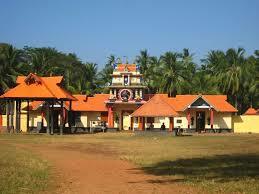 Here is Some Information about Janardana Temple in Varkala Kerala India. The Janardana Temple is located On a steep hill Varkala in kerala state.The temple was built 2000 years ago and built by Group of mendicants.The temple is dedicaed to Janardana swami lord vishnu.Janardana Swami is a form of Lord Vishnu. It is a very well known temple in Kerala about 3 km west of Kallambalam on NH 47 near sea, 25 km north of Thiruvananthapuram.It is situated near the Arabian sea shore.It is referred to as Dakshin Kashi (Benares of the south). The temple is located close to the Papanasam beach, which is considered to have medicinal properties since the waters wash the nearby medicinal plants. It is also an important Ayurveda treatment centre. The temple has an ancient bell removed from a shipwreck, donated by the captain of the Dutch vessel which sank near Varkala without causing any casualties. Varkala Janrdhanaswami Temple is popular not only as a pilgrim centre but it also allures everyone with its architectural splendour. 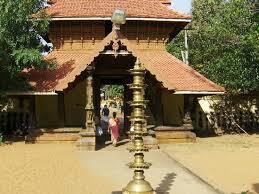 The temple faces Papanasam beach and the proximity to the sea adds to its spiritual as well as aesthetic aura. A flight of broad steps lead to the Janardhana temple and on the way, you will be greeted by a high entrance arch with tiled roof. An old banyan tree stands on the temple ground and idols of several serpent gods and goddesses are also installed here. 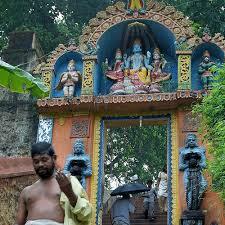 Brightly painted idols of Hanuman, Garuda, Lord Shiva and others greet you once you are about to enter the sanctorum. The main shrine Lord Janardhana (Vishnu) has four arms in which are placed shanghu (the holy conch shell) chakra (wheel), gada (mace) and kumbham (pot). The temple has many attractive features and it has a circular sanctum sanctorum surmounted by a conical dome of copper sheets. The mandapa or pavilion is square in shape and it has wooden carvings of Navagrahas (nine planets) on the ceiling. 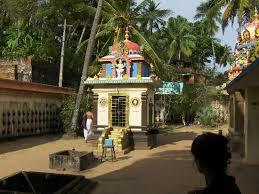 There is a hall in which the bali peetha is situated and this too is an important feature of the temple architecture. Though the original date of construction of the temple is not available, there are some inscriptions which indicate that the renovation of the temple had been carried out at different periods of history. One of the inscriptions says that the temple was renovated by Umayamma Rani, who ruled this region in the later 17th century. An ancient inscription dated 1252 has also been found on the temple premises. It is seen engraved on the lower part of the mandapa before the temple. Tall granite posts and heavy brass bells hung from ceilings too evoke interest in a connoisseur. The oil trays cut in the granite posts hold lighted wicks during evenings and it is a treat to the eyes. 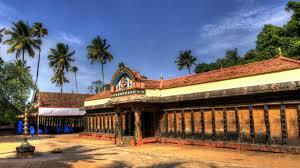 There is a pool called `Chakra Theertha’ on the northern part of the temple which is about 240 ft in circumference. By Road : Varkala is nearer to Kollam (35 km). It is on the NH 47 to Kallambalam Junction via Pallipuram and Attingal as well as the State Road to Varkala. It takes 1 hr from Kollam, 2 hrs from Thiruvananthapuram and 4 hrs from Ernakulam. By Rail : Varkala has its own railway station. You can board a train from Thiruvananthapuram to Kollam or Kochi and get down here. However you need to check if the particular train has a stop at Varkala. By Air : Nearest airport is Thiruvananthapuram International Airport, 55 km away.